FERC’s commissioners denied requests for rehearings of the final decisions on environmental impacts and public necessity and convenience (June 15, 2018), even though those decisions were clearly based on false information. The 4th Circuit pulled the USACE National Permit (NWP) on June 21, 2018 but restored it for construction on August 30, not knowing that FERC was about allow a project-wide variance. On a split vote, the Virginia State Water Control Board, voted not to consider revoking MVP’s 401 water permit in Virginia (August 21, 2018), also not knowing that MVP could not meet water quality standards. Nor did they know that MVP and the FERC planned to dramatically reduce the required standards by issuing a project-wide variance in September. The 4th Circuit vacated the USACE NWP on October 2, 2018 but did not halt all construction, perhaps because they did not know that water crossings were not the only “constructability” issue on the route. Failures continue to occur over and over at the same locations due to inadequate erosion and sedimentation planning and controls. FERC must issue an immediate Stop Work Order along the entire route, not limited to streams and wetlands. MVP used cookie-cutter, computer generated plans with little respect for the steep slopes, landslide prone soils, seismic activity and karst formations along the 300+-mile route. A highly regarded study by karst geologist Ernst Kastning concluded that much of the MVP route should be a “no-build zone” due to these very well-documented problems. Hundreds of individuals and organizations (including the ICWA, U.S. Forest Service and Roanoke Appalachian Trail Club) challenged MVP’s plans and requested site-specific reality-based plans for each water-body crossing. MVP insisted that they knew what they were doing without such plans, and FERC allowed it. A senior MVP official told RATC in a live meeting (June 2017) that drilling under that Appalachian Trail in the middle of an active earthquake zone, atop two steep, landslide-prone slopes with karst at the base of the mountain would be similar to constructing a pipeline in Florida. Yet FERC, the U.S. Forest Service, the Bureau of Land Management, the Virginia Department of Environmental Quality and the West Virginia Department of Environmental Protection accepted MVP’s arguments. In other words, they admitted what everyone else had been saying for years – they were not looking at the real conditions on the ground. What did do FERC do in response? Hid all correspondence on this subject from public view until the ICWA completed a Freedom of Information Request (FOIA) and received the documents in October and November 2018. Granted a project-wide variance to MVP in September 2018 that allowed the company to bury pipe less deeply than required and make other decisions along the entire pipeline route with essentially no oversight. In the fulfilled FOIA request, FERC also redacted [hid] the name of the FERC project manager – Paul Friedman. Why? If the expert federal consultant on a pipeline project concludes that it needs more specific information, should the federal project manager loosen the standards? If a corporation admits that they miscalculated the difficulty of a project (despite thousands of pages of testimony that should have changed their planning) and says they just don’t want to pay to do it right, should the federal project manager accept their approach? If a federal agency and its commissioners approve a project with detailed standards for Best Management Practices, should all these promises be thrown out by signing a “variance”? Is the whole project simply a variance from what was approved? If a federal agency hides all discussion of these problems from the public, its own commissioners, federal courts and state regulators, might there be a problem? If the agency hides the name of its project manager when the public legally acquires the relevant documents, is there reason for concern? PRIOR TO THE FERC APPROVALS, HUNDREDS OF OTHER SOURCES SAID MVP’S PLANS WERE TOTALLY INADEQUATE (December 2015-June 2017). See details above. FERC PROJECT MANAGER PAUL FRIEDMAN IGNORED HIS OWN CONSULTANT AND SIDED WITH MVP (June-September 2018). In every transaction related to erosion and stream crossing issues, Friedman sided with MVP. He allowed them to file new plans that did not include site-specific scenarios and allowed them to ignore Best Management Practices and adopt vague promises of “monitoring” damaged stream crossings instead. 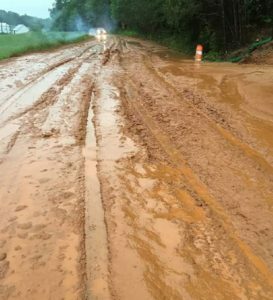 He ignored comments from the U.S. Army Corps of Engineers (USACE) that the Huntington district did not have enough information to comment and the Norfolk District stated that it was out of their jurisdiction. As far as anyone can tell, he never even asked Virginia and West Virginia environmental regulators whether the new plans were acceptable, even though the new plans would fall within their jurisdiction and might negatively impact state waters. FERC KEPT VITAL INFORMATION ABOUT THESE DECISIONS SECRET FROM THE PUBLIC (June-November 2015). By labeling correspondence among FERC, MVP and USACE “Privileged,” the lead federal agency HID FROM THE PUBLIC EYE major admissions by MVP as well as unanswered questions from Cardno and comments by USACE. ICWA had to use the Freedom of Information Act (FOIA) to recover the documents, a task that was not completed until November 2018. FERC REDACTED THE NAME OF ITS OWN PROJECT MANAGER IN RESPONDING TO THE FOIA REQUEST (September-November 2018). Both FERC and USACE responded to the FOIA request. They produced almost identical documents, except the version provided by FERC removed the name of Paul Friedman, the FERC project manager for MVP. Hmmmm. 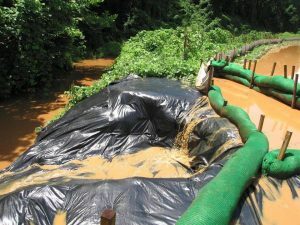 MEANWHILE FERC HASTILY APPROVED A TRULY OUTRAGEOUS VARIANCE FOR MVP, ALLOWING THEM TO FREELY BURY PIPE CLOSER TO THE SURFACE ANYWHERE THEY CHOSE NEAR STREAMS ALONG THE ENTIRE ROUTE (September 2018). Rather than requiring better planning by MVP, FERC abandoned previous standards and issued a variance for the entire project (MVP-006) that enables MVP to bury pipe closer to the surface, abandon Best Management Practices they had pledged to follow, and simply “monitor” for damage rather than mitigating the clearly negative impacts of the project. MVP’s request for this variance was posted on September 25, 2018 and approved by Project Manager Paul Friedman on September 26, 2018 – only 25 hours after it was posted. SUSPICIOUSLY, THE VARIANCE WAS APPROVED AS MVP ANNOUNCED A DELAY IN PROJECT COMPLETION AND A LARGE INCREASE IN PROJECT COSTS (September 2018). On exactly the same day that MVP submitted the variance, MVP reported: “In a revised estimate announced this week, the developers of the natural gas pipeline said they now expect to spend $4.6 billion on the project, a jump of about 25 percent over their previous calculation of $3.7 billion.” (“Estimated Cost of Mountain Valley Pipeline Increased to $4.6 Billion,” Laurence Hammack, Roanoke Times, September 25, 2018). Obviously, the company’s inaccurate assessments of project difficulties were costing them money, and FERC was prepared to help solve the problem. The 4th Circuit pulled the USACE National Permit (NWP) on June 21, 2018 but restored it for construction on August 30, not knowing that USACE had expressed reservations about the ability of MVP to meet water quality standards. On a split vote, the Virginia State Water Control Board, voted not to consider revoking MVP’s 401 water permit in Virginia (August 21, 2018), also not knowing that MVP could not meet water quality standards. Nor did they know that MVP and FERC planned to dramatically reduce the required standards by issuing a project-wide variance in September. “FERC must issue an immediate Stop Work Order along the entire route, not limited to streams and wetlands. The fact that MVP admits the deficiencies in its use of a theoretical desktop analyses in its stream crossing analyses should alone automatically trigger a call for a Stop Work Order until it can provide ground truth on the crossing of all streams on the pipeline route. Importantly, streams are not the only locations where FERC has allowed MVP to submit only desktop analyses. FERC should issue a Stop Work Order until they can determine what other non-stream “mitigation measures, as written, would pose increased environmental or landslide risks, or be unsafe or impractical due to terrain or geology. “FERC must require a Supplementary Environmental Impact Statement that includes a full and rigorous public comment period. The information contained in the three documents reveals that what MVP submitted as Variance MVP-006 is not actually a “variance”. It is a behind-the-scenes post-Certificate re-write of the permit conditions that also reveals MVP’s blatant sense of empowerment to refuse a direct request for site-specific calculations and plans by FERC’s lead environmental contractor.